Even after 14,575 miles, many of them gliding silently on a waft of electric torque, enough Toys to guarantee an R Us appendage and one Guinness World Record, I'm afraid most of the CAR team fail to warm to Infiniti's M35h. Sorry to disappoint you if you were expecting me to build up to the conclusion, but there it is, in all its stark brevity. The M is a fine vehicle in many regards but after nine months at CAR HQ, Infiniti's first hybrid failed to worm its way into our affections the way that best-in-class cars should. We've had a busy life together, piling on an average of 1800 miles a month, driving from the west coast of Wales to the wilds of Lotus territory in Norfolk; from the south coast of England to the Scottish border. We never ventured abroad but we did enjoy a stint on track at the Santa Pod Raceway in Northamptonshire, where we set an official world record for the fastest-accelerating hybrid car over the quarter mile. The certificate still hangs in my bog. A silly promotional stunt perhaps, but in its first week on fleet it demonstrated that this is a seriously quick saloon. It's Boxster-fast, hitting 62mph in 5.5sec as we passed the quarter mile in 13.8 seconds at 103mph. That's as rapid as a 1982 Lamborghini Countach S.
But this duality of purpose is one of the confusions at the heart of the M's character. In fairness, Infiniti positions it as a performance hybrid rather than a gallon god, and its brisk acceleration impressed us far more than its economy. Over nearly a year we averaged 29.3mpg and during our recent office outing to Snowdonia for last month's long-termer punishment, its appetite for unleaded soared to 24mpg. Still, if all this sounds negative, let's dwell on the M35h's strengths. And it has many. Road test editor Ben Pulman and I often raved about this car's long-distance cruising ability: the comfy, ventilated seats, its classy, alternative dashboard milieu, brilliant Bose stereo and a hushed, double-glazed refinement were a godsend on motorway schleps. Best bit is how the car 'sails' if you back off the throttle even at high motorway speeds. The engine falls silent and the transmission switches to electric mode, giving that saintly buzz you get in a Prius around town - but at 80mph. If you buy a hybrid, you want to feel good about it every day and the M ticks that box. It runs on EV mode more than most petrol-electric cars. We suffered no faults. I thought the driver's heated seat was broken but it came back from the very plush Infiniti Birmingham (our nearest dealer - 83 miles away!) with the seat still only registering a mild frisson of buttock toastiness. They checked it during the car's 9000-mile service, which cost £300 and was made miles easier by the fact they picked the car up and dropped it off again the following morning, leaving us an EX30d as a courtesy car. Our car came with no options except the inky Malbec Black metallic paint at £679. Niceties such as keyless entry, rear parking camera, radar cruise control and a clever multimedia system (syncing seamlessly with most phones) were all standard. All of which made it easy to take a deep breath, relax and waft around in this car. But truth be told, it wasn't enough to counter the numb steering, unsophisticated chassis and minuscule boot. Seemingly you agree: Infiniti sold fewer than 30 M35h hybrids last year. Word of warning to high-mileage executive types: Infiniti is stuck with decades-old servicing intervals. Our M requires maintenance every 9000 miles, comparing badly with the German rivals it's aimed at whose variable servicing typically doubles that for M-way-pounding types. This took me so much by surprise that we were actually a little late getting the M35h booked in for its first service, 11,856 miles showing up on the odo. Woops. Bearing in mind how well built the M is, the quality of modern lubricants and Nissan's reputation for reliability, I can only imagine the shortened service intervals are a business decision to increase turnover at dealerships. And with a small pool of Infinitis in the UK at present, that must be imperative for the fledgling network. So we booked in at Infiniti Centre Birmingham. Thankfully they still come and collect your car for you - a godsend, as I work 83 miles away. Will they still do this when they have a 40-strong dealer network in the future? I doubt it. But then I'll have less far to travel. There's no doubting the experience at Infiniti Centres though. A friendly chap arrived at my office, picked up the keys to our M35h and left us with an EX30d. Not your average courtesy car - I was half expecting a Micra. And that was it. No hassle. No waiting around. They simply turned up the following morning with our pristine hybrid, collected the courtesy crossover and it was job done. All this was normal customer experience - we weren't booked in as journalists (although our car's number plate is a bit of a telltale). When I ran CAR's BMW 530d Touring last year, I paid £247 for the first oil change service at 17,000 miles. Which makes the Infiniti roughly double the cost to maintain, bearing in mind its shorter intervals. But our M35h came back with a clean bill of health and I'm left feeling it's bulletproof. The hybrid's battery is in near 100% state of health (encouraging bearing in mind our fears over battery degeneration in the long run) and a very clear service report found 'no faults on any vehicle systems'. The winter tyres still have a chunky 8mm of tread at the front and 7mm at the rear. (We're about to change those back to summer rubber though). So our M35h hybrid is now slightly out-of-date. Infiniti this week announced a revised version which nudges CO2 emissions below the all-important 160g/km barrier. It's all a bit nerdy, but crucially it's enough to lower its company car tax band by one grading to 22% for the 2012-13 tax year. For a typical 40% taxpayer, that means you'll save around £180 annually on your company car tax. And that new magic 159g/km CO2 reading (down from 162g/km) means your business can claim the higher rate of Write Down Allowance, which means they'll claim 20%, or double the amount of money back, as a legitimate capital expenditure (they can claim only 10% back if the fleet car in question pumps out over 160g/km). 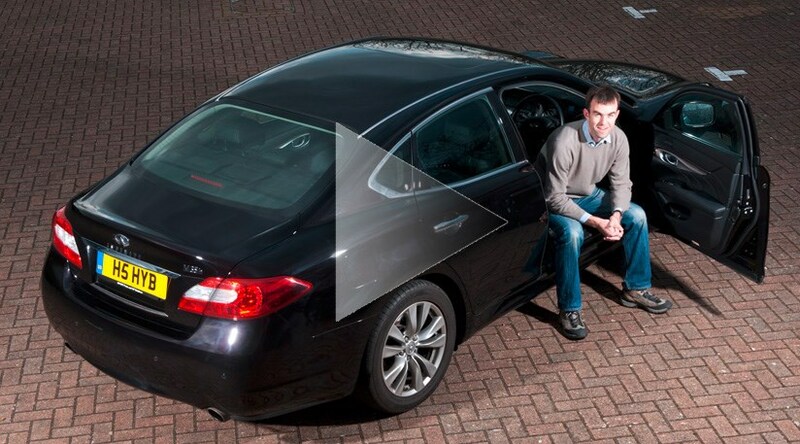 How has Infiniti saved the extra grammes? By tweaking the electric motor and battery charging system, apparently. No tall gearing or skinny eco tyres here. So the M35h'll now creep around silently on electric power even more frequently. That's impressive - it already drives in EV mode more than most hybrids I've driven. The new 2012 M hybrid goes half a mile extra per gallon - now averaging 40.9mpg. Obviously, we say that figure must have been produced in Cloud Cuckoo Land. Our M35h hybrid isn't averaging anything like that (we're struggling to break through 30mpg in everyday driving), so I'm not sure the M will be in demand if there is a fuel crisis in the UK if the petrol delivery tanker drivers go on strike. See that reading on the instrument cluster? It hit a brisk -6deg C last night as I drove home. It's at times like that when niceties like a heated steering wheel make sense. The Infiniti's helm gets nice and toasty which takes the edge off clammy cold leather in a jiffy. The heating elements in the wheel are much better than in the seats in fact; the driver's side pew seems to have given up the ghost, so I plan to get this checked out when I have the car serviced soon. (Infiniti service intervals fall at a very unGermanic 9000 miles - about half what my last 5-series did). While we're on the instrument cluster, check out the range reading. I've just brimmed the M hybrid and it's saying we've got 400 miles onboard. Compare that with the Jag XF 2.2 diesel poster I saw today at the station; it boasts a Geneva-friendly 800-mile range. Makes you think twice about efficiency, no? We're still averaging around 29mpg in our Infiniti. I promise a fuller analysis of our economy figures in my next online report. You might have seen in the new February 2012 issue of CAR Magazine that we succumbed to the winter tyre craze for our M. There's still only a handful of Infiniti dealerships in the UK (another five open up this year) so we were directed to the Infiniti Centre in Birmingham. O kay, okay - we could have just shopped at Kwik Fit. But like many manufacturers, Infiniti offers a branded winter tyre programme and we wanted to try out one of the brand's dealers. Heavens knows I've heard enough promotion over the years from Carlos Ghosn downwards about how boutiquey and different they are. Time to find out. Brum's not exactly that close to Peterborough - a good hour and a half away by car. A new Infiniti Centre will open in Cambridge later this year, but it doesn't really matter; they come and pick up your car for servicing anyway. So we trundled over to Birmingham and found the dealership slap bang in the middle of one of the city's busiest arteries, the A45. Many UK cities have a Garage Row - and this was no exception, with Audi, Mercedes and other premium garages within kicking-tyre distance. It's an old Nissan showroom, but you'd be hard pressed to know. I found ample parking, friendly staff and, begrudgingly, even accept that there is something of the boutique hotel about the Infiniti experience. There's lovely paint schemes, Walter Knoll furniture and flat screen TVs. I've been to two Infiniti dealers now, and both have felt very premium. Let's not comment too much on the service itself - this particular tour was not incognito - but while I chatted to centre manager David Topham the M35h was hoisted up on to the ramp and four new Continental ContiWinterContacts were fitted in 90 minutes. Infiniti charges £1200 for this plus VAT. Call it £1440 all in. Although you can halve that at Kwik Fit, the hassle factor is in Infiniti's favour as they'll store your boots for you. Have we noticed a difference? You can read my separate blog on winter tyres here, but the Infiniti is now possessed of a devilish grip on tarmac even in icy conditions. I've tried to brake hard on slippy roads and it's impressive how much deceleration they generate before locking up. We've yet to have proper snow around these parts, but having seen the forecast for this weekend, I suspect I'll have an update for you soon. Another report on the Infiniti M35h from a different member of the CAR team, and another glowing account of its epic cruising abilities. Comfortable seats, decent high-speed ride, a good sat-nav and magnificent refinement, plus the heated steering wheel is a boon on cold mornings. The only downside is that 70mph suddenly feels very, very slow. The M35h impresses less away from the motorway: the steering is too light and lacks any feedback whatsoever, and there’s too much body roll. According to its official keeper, Tim Pollard, it’s averaging around 30mpg too. Which is nothing more than okay. A diesel would do much better. Of course you could argue that a petrol engine (especially when hybridised) spews out fewer particulate nasties than a diesel. But you’ll never convince me that carrying around kilos upon kilos of batteries is environmentally friendly, even if the official NEDC test says otherwise. And if you’ve got an M, it’s only available with V6 power so I doubt it’s a company car. Emissions over 160g/km compare with sub 130g/km from the best German diesels. That means the M35h has to be a personal rather than economic choice over the M30d, but I’d stick with the latter and go twice as far on a tank. Then its mile-munching ability would be even better. My Audi A1 wasn't the appropriate car to ferry two adults, a teenager and a boot load of pressies north to my sister's at the weekend, so I borrowed our Infiniti hybrid for the schlep north. And in the cold winter weather, I found the M's standard heated steering wheel an absolute joy. It's probably an extravagant luxury, but it certainly takes the edge of cold leather early in the mornings. I was less impressed by the boot, however. The M35h is not exactly a small car, but those lithium batteries mean that the boot is disappointingly small. In fact the whole interior is comfy and luxurious, but not that spacious. Perhaps we should blame the bulky centre console and thick seats; the M's not as roomy as I'd expected for a long family drive. Don't get the wrong idea. The car still charmed me and my passengers. It has, as may be expected of a record-breaker, great acceleration although I had to adapt my driving style a little to overcome a little lag as the hybrid system shuffles between petrol and electric power. The Infiniti M35h is very smooth to drive on a long run, offers a great turn of speed and that hybrid tech means it does a good stint on not much fuel. I like the look of it, too - it's like an executive but the nice sleek curves give it wider appeal than the German establishment. The only problem I now have with Christmas around the corner is finding £47k to buy one for the other half. He adores it. One final gripe: the M's sun visor. Winter sun is horrendous if you forget your sunglasses before setting off for a long drive and the Infiniti's visor is too narrow for my stature. I found the curved cut-out at the corner of the windscreen allowed too much blinding sun to peek through. In the current December 2011 issue of CAR magazine I've extolled the virtues of our M35h hybrid as an airport commuter vehicle par excellence. And having just racked up nearly 10 hours driving in just 36 hours - ending up at Heathrow again - I can confirm the M's status as motorway king. It's a wonderfully relaxing environment in here. The seats don't adjust quite as much as my old 530d's, but they leave me remarkably fresh after long stints at the wheel. The hybrid comes only in top spec, so the hide-bound pews are ventilated and warmed as standard. No massage function, mind. The centre console helps create that relaxing vibe. Where all current German executives are a bit straight, a teensy bit joyless inside, the Infiniti feels warm and friendly. That silver-flecked wood trim from grand piano maker Yamaha helps no end and the buttons are simply labelled and large. There aren't too many of them either (Panamera, take note). I reckon they've judged the - terrible mumbo-jumbo alert - human machine interface really well. You can use the central scroll button or the touchscreen to input most commands. Or the voice control, which I've not yet dared use. Sceptics will call this a posh Nissan, but three months in and I'm converted to the interior. Materials are plush, build first-rate and it's quite a refreshing change from the establishment. The Nissan Connect multimedia system makes an appearance and I'm a big fan. Synching with iPods is seamless, the sat-nav takes full six- and seven-digit postcodes and the hierarchy of menus is logical. The only bit of kit I miss is a DAB digital radio, owing to the dire local stations like Peterboghorror FM around these parts. I've previously mentioned the joyful 'sailing' function at a cruise. Even if you back off at 70mph, the petrol engine shuts down and you glide silently down the road, a smug halo rising overhead. It helps you chill out and I find myself triggering it on purpose if I'm cruising downhill. I've also been experimenting with the radar cruise control. Like most of these systems, it works well enough but I find the juddering deceleration annoying when it picks up a car in a different lane on M-way corners. These systems are still no match for a human mind. Our next update? We plan a deep look at the M35h's economy figures. Stay tuned. This is probably the acid question on this long-term test. Namely, should you spend £46,840 on the M35h hybrid, when the M30d diesel is available from £40,190? Or – if you're feeling brave - £38,580 on the petrol M37? So the hybrid should save company car drivers – and private buyers – money in lower running costs. On paper, at least. And Infiniti is said to be working on a sub 160g/km target for the M35h's fleet credentials. Our fuel consumption in the M35h is still settling down after our Guinness world record shenanigans in its first month with us, so we'll drill into our economy in fuller detail soon. Suffice to say of late we've been averaging around 31mpg in the hybrid Infiniti. For the sake of comparison we booked a week in the petrol and diesel Ms and recorded our fuel consumption in each. Unsurprisingly, the petrol was thirstiest at a pricey sounding 24mpg over a mixed week's driving. Which was cleaner out of the diesel and petrol-electric hybrid? The M30d averaged 32mpg, the M35h 31mpg. So the hybrid has a suffered a bigger disparity between the claim and reality. Which might make you think twice before ordering – especially when the derv was refined, smooth and torquey enough to be a credible alternative to the German hegemony (although its emissions are some way off). Our new Infiniti long-term test car has been around for a few weeks now - you might have seen it set a Guinness World Record in its first week with us. We won't regale you with stories of our new hybrid car land speed record here (click here for our blog at the time), but you can watch the video from Santa Pod in our video player below for those who missed out. So why did we choose to run an M35h on our long-term test fleet? Simple. Infiniti is still a tadpole in Europe's executive ocean - a tiddler which sold just 232 cars to Brits in 2010. But the marque is hellbent on expanding over here and across the EU, to make it a credible premium player like it is in the US. The chief executive officer of Nissan, Carlos Ghosn, told me the plan for his upmarket wing was to quadruple sales to 700,000 a year, taking 10% of global luxury sales. Tellingly, there was no deadline put on this ambition - he's too canny for that - but make no mistake. With the muscle of Renault-Nissan behind this plan, it's not one we'll take lightly. And that's where CAR's long-term test comes in. We know that plenty of you will scoff at Infiniti as a credible rival to Audi, BMW, Merc or Jag. And so do some at CAR. But remember 1989? When Toyota launched Lexus? Although still selling a tenth the cars Merc does in the UK, Lexus has now become a real player in the executive sector. And that's exactly what Ghosn wants to achieve in Europe with Infiniti, albeit with a more sporting, BMW bent. So the M's joining us for a longer test to see how it fares. Can it win us over with its style, its luxury, its plain technological cleverness? We're about to find out. I have run BMW 5-series and Jag XFs in my time at CAR, so was deemed the appropriate tester for the job. I'm open minded enough to consider Infiniti a rival, yet know how high standards have to be in this sector. Ours is Infiniti's first hybrid, a clever system mating the older 302bhp 3.5-litre V6 with a 67bhp electric motor in something they rather grandly call the Infiniti Direct Response Hybrid system. One of the key points of differentiation in Infiniti's hybrid set-up is the use of two clutches to juggle power supply. It works like this. The first (dry) clutch sits between the V6 and e-motor, allowing the car to V6 to decouple when in EV or regenerative braking mode. The second (wet) clutch sits in the automatic transmission, sandwiched between the electric motor and the cogset. It essentially replaces a torque converter, making the seven-speeder act a bit like an autoated manual. Infiniti claims it's 10% more efficient as a result. Speccing our Infiniti M35h was simple. It only comes in one spec - top-dog Premium Luxury - and has absolutely everything. Leather, heated and ventilated seats, electric blinds, the mother of all sat-navs, heated steering wheels... all are standard. As they should be for £46,840. Stay tuned over the next few months for regular updates on our Infiniti hybrid.